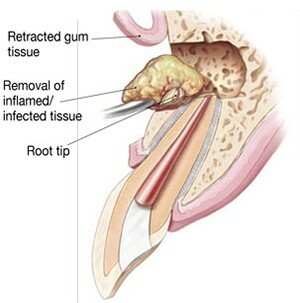 Generally, conventional root canal therapy is all that is needed. Success rates for a non-surgical treatment are very high, but occasionally microsurgery is needed to save a tooth. This technique can be useful in locating root fractures and treating canals that may not be able to be accessed through standard root canal therapy. The most common microsurgery performed by Dr. Appelin is called an apicoectomy. Scroll down to learn more about apicoectomy. What do you mean apicoectomy? With all of our surgical procedures you can stay in the dental chair just like you are having a long filling. 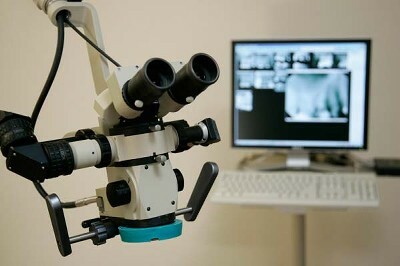 The Surgical or Operating Microscope (see picture above) will be used during the procedure to give the best view of the surgical field and increase probability of a positive outcome. If surgery has been mentioned an area of persistent infection of the apical bone, (at the tip of the tooth) is a likely reason. Local Anesthesia to get you numb is normally all that is necessary. The Microsurgical technique involves use of the surgical operating microscope to visualize and aid physically removing the entire source of infection. 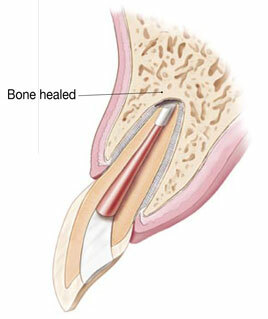 The tip of the tooth is usually removed to ensure cleanliness of the bone after the procedure. A small filling is placed in the root end. 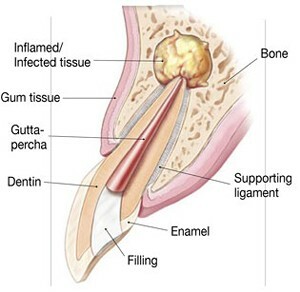 The gums are gently repositioned and a small suture is placed to hold everything in place. The most common symptom following surgery is an itching of the gums or irritation from the sutures. 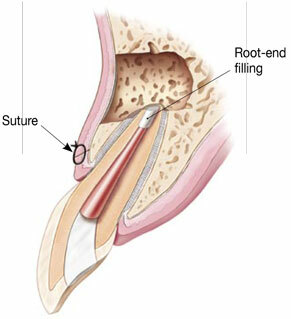 Sutures are usually removed 2-3 days after the procedure, in some cases sooner. The healing process is virtually pain free. When the source of infection and damaged tissue has been removed healthy tissue, nerve and bone can replace the surgical site. At close inspection, a small scar may sometimes be seen on the gums where the incision was made. This is usually hidden by the lips and is usually noticed only by other dentists in an oral exam. Best of all, the crown of the tooth has not been touched, and appears the same as before the surgery. If you have a new crown, or if replacement of an existing crown is an un-desireable outcome, apical microsurgery may be indicated for you.